I just recieved some CK yesterday from the CurlMart. I'm not really sure how to use it, and how much. Like, when should I apply it? Before my leave-in? After my cream styler (LOOB)? And how much - a few puddles? How do you gals use it? I apply it over a leave-in and I rake it in but I know a lot of others scrunch it in. Raking doesn't interrupt my clumps, scrunching gives me frizz. I use two huge puddles and usually end up scrunching out a little bit of crunch when it's dry. I think it is meant to be a final coat to keep the frizzies from popping out. So you use it last? After gel? I use it after a leave-in, and before gel (or other stylers). I also use several smaller puddles throughout the hair. It's best to apply to wet, not damp, hair for best curl formation. I also apply before gel. I scrunch in my sopping wet hair. I have not tried in after gel though. I apply it before gel, although I haven't been using much gel when the humidity is low- just CK. I apply after my leave-in and before my gel. I have below shoulder length hair and I scrunch in a nickel size puddle, while my hair is flipped upside down. I do not use CK as a curl enhancer, I use it more for a frizz buster. Happy experimenting! On Monday I used the Curlmart discount to buy some CK, and was here seeking the same answers before applying it for the first time. Thanks for everyone's responses–they were all very helpful! As I was bending over to plop a few minutes ago, I could already tell that my hair is going to be a LOT less frizzy today. Normally my hair declumps a bit and frizzes up during the product application process, then plopping helps it reclump. Today I only saw a very small strand that had un-clumped, but everything else was looking perfect. I can't wait to see what it looks like when it's dry. I just got my CK this week too, and I am LOVING IT!! I use about three nickel sized puddles and scrunch through, and then use Biotera Curl Creme over it. I normally hate to layer products, but this is an awesome combo, and my hair feels great and not producty. I have below shoulder length hair and I scrunch in a nickel size puddle, while my hair is flipped upside down. Wow! I wish I could get away with a nickel size puddle! I use two palmfuls on my hair... which is why I can't afford to use CK all the time. But I do love it!!! Nothing makes my hair clump better than CK. I use it on sopping wet hair. 3a/3b, Coarse, Very thick, bra strap length and growing! I really recommend that CK is the first thing that touches your hair. Leave ins and gels will be just as effective when applied after but CK may not be as effective if applied after. And I'm jealous of the two palmfuls---I use 7-10 deep puddles!! Yikes! This stuff is like liquid gold! I'm on flickr now but i don't know how to put in the website for all to see without putting down the website with me already being signed in. I have BSL hair and I LOVE CK--lately it's all I use--I used to use it with many other creams, gels etc but since May I've been using just CK alone and have been loving my hair. Will work on the flickr thing. I got mine this week too, and I'm totally in love. I've used it over recoil, under recoil and alone today and I'm totally hooked on it. I recently cut my hair to above my shoulders and cut all the curl out, or so I thought, until I got this stuff and the recoil. I'm so happy I found this board to know about these products. It's a night and day difference between what you can get at the drug store/mart and what you can get online here. Amazing. This is my second time using and I too love it. I bought CK at Jonathan Torsh Curly Hair solutions salon. When they told me about it and used it on my hair I started to like it. Of course they do a better job than I do. I think t his time I did not dry my hair enough or I put too much. I feel parts of CK dry in some areas and this is due not drying properly. This did not happen last week when I tried it. In any case my hair looks much better than it did before. The first time I tried this, the smell of the CK really bothered me. Does it seem to have a strange/strong scent to anyone else? I have some chin breakouts and I'm concerned it may be due to the CK. I have sensitive rosacea skin so fragrances are usually a no-no (I use the unscented Jessicurl). Have people had good luck using CK in the winter? I too would be interested to know if anyone uses CK in the winter and does it work as good as it does in the winter? sorry, but was is ck???? thanks for clearing that up for me! Is it available at ulta or trade secrets? 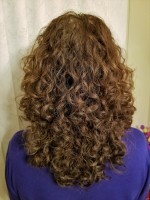 I bought ck at curly hair solutions salon. in the Toronto area. I knww it's available online and at curlmart.